Often times as a jeweler, the most enjoyable aspects of working on a one-of-a-kind piece are the less stressful moments of finishing up a project. 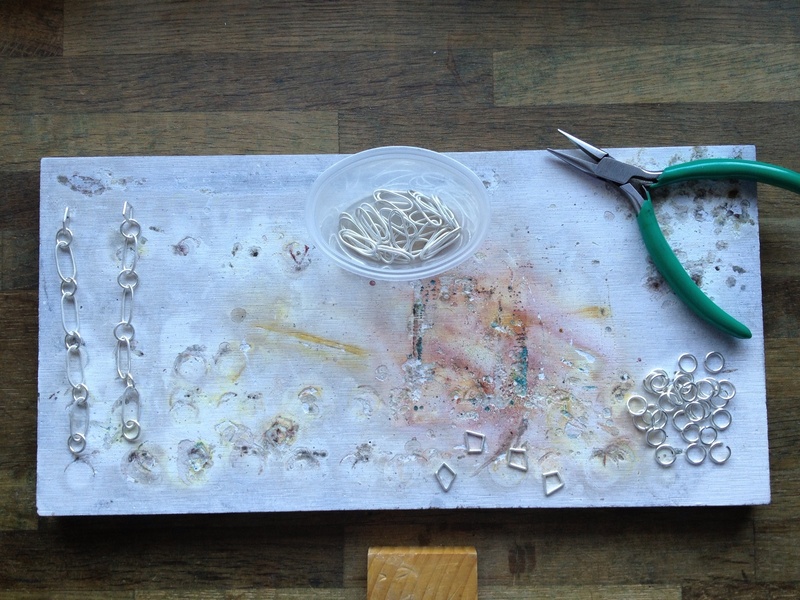 Making sterling silver chains from scratch is something I find relaxing and often cathartic; it’s a very different aspect from the conceptually-driven mainstay of my lockets/necklaces. In this case, every detail is caringly done from a single piece of round silver wire, and when complete, this handmade chain will be the suspension means for one of my new lockets. 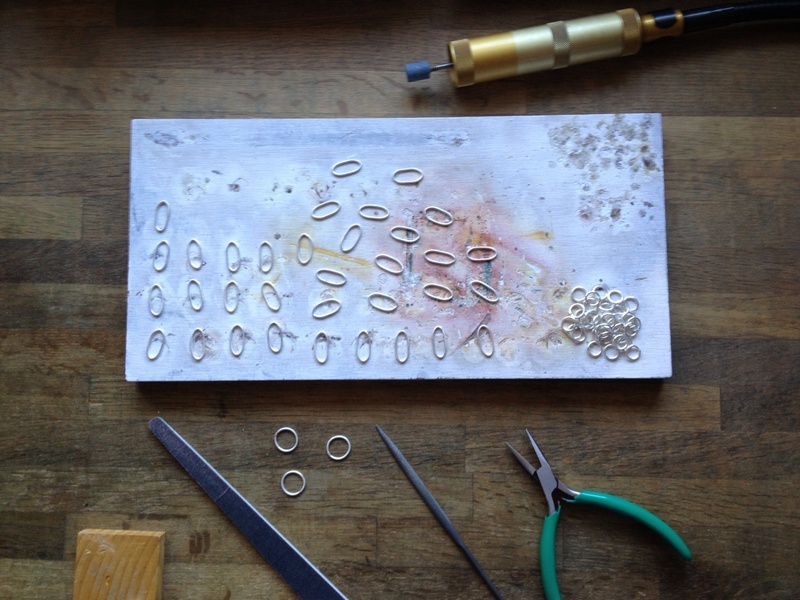 Using a jeweler’s saw and winding the sterling wire around wooden dowels of various sizes, I create round jump rings that are first silver-soldered closed then pulled into ovals by using chain-nose pliers. My favorite pattern at the moment is alternating oval links with smaller round rings, with every fifth or so link attached to a triangular link that is painstakingly hand-fabricated also from round sterling wires. I measure 12mm for the top piece, score it in half, bend, and silver-solder it to a second fabricated element that is 16mm for the bottom piece. As much as I’m an American girl raised in the English system of measurement, I prefer to use the metric system of mm and cm measurements when doing metalwork, as it allows me to be more precise. 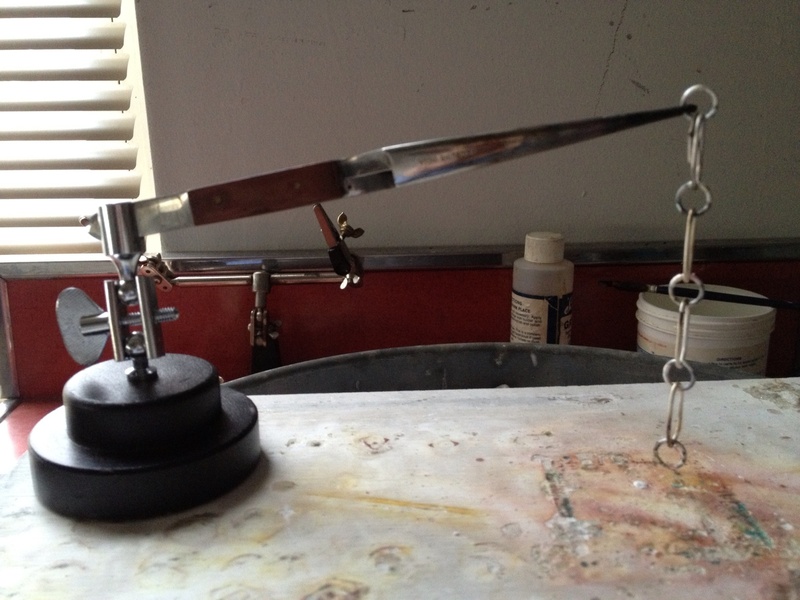 Using a “third hand” (metalsmith’s term for interlocking tweezers attached to a metal base) I place a fully assembled section of my chain onto the soldering pad and line up the opening of the jump ring near the top as I get ready to use the torch to silver-solder the smaller round links closed. The trick here is to assemble the chain on the soldering block as I move along, due to the oval links already being soldered shut and the seams lightly filed/sanded. The part where it helps to be the most fastidious is in the placement of the silver solder pallions directly over both sides of the round link. This assists in the chain links being neatly soldered and knowing that the chain will be sturdy and unlikely to catch on clothing or pop open. As I move along the chain, I get into a routine where I place the solder pallions, heat the entire link with the torch, melt/flow the solder onto the link, then switch to the next link in the chain using tweezers only, as the overall chain will still be extremely hot. One needs to be very careful during this part, as wrong placement of solder or the use of too much flux can cause the solder to “jump around” the link’s opening. Jewelers learn early on to become rather ambidextrous, holding the torch in the left hand while constantly repositioning the tiny solder pallion with a soldering pic or steel tweezers in the right hand. Once a reasonable amount of chain length has been fabricated and soldered together, I pickle and clean the piece, using a brass brush and mild soap to bring out the shine of the sterling silver. In this photo, about one-half of the final chain is complete. Now it’s back to the soldering block to finish the other side/half of the locket’s chain. Once both sides of the locket’s chain is complete, I place the chains in a rotary tumbler with a light burnishing compound added with pieces of steel shot. The tumbling of the silver chain against the pieces of steel shot work-hardens the chains and creates a brilliant glistening finish that’s really difficult to match by other means. While there’s quite a lot of “shop talk” about metalwork here, Rio Grande Jewelry Supplies in New Mexico, USA has extensive information on their website and is a fabulous place to look up specifics regarding the tools and materials jewelers use. Meanwhile, a few rooms away and as this is all taking place, I have a soon-to-be eleven month-old “studio assistant” named Ivan. As you can see, he is an extremely “dedicated artist” and helps me maintain that level of low-key calmness that is imperative to my well-being as a metalsmith and studio jeweler. 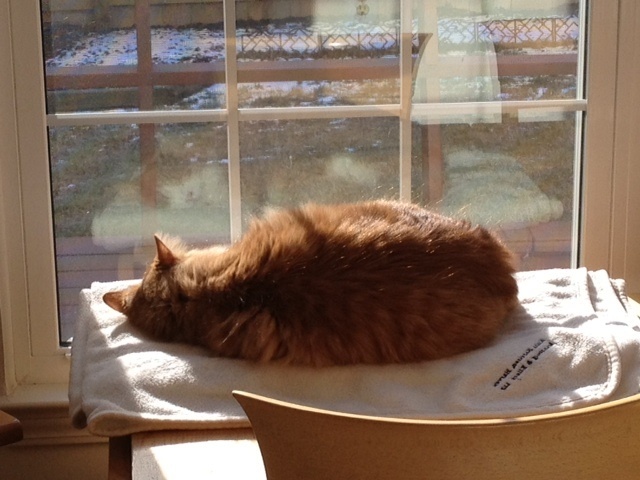 Ivan is a most loving male cat and a treasure to have with me during my workdays. Every artist should be as lucky as I am. What a fab insight into the art of silversmithing. I would definitely benefit from a “third arm “when i am working with small things. Ivan looks adorable and ! would love to see his face one day. He looks like he would be very helpful in maintaining a calm atmosphere. Thanks so much, gentlestitches. Ivan is quite the character and will definitely be making more future appearances (as will his older sis, Indie!) I’m glad that all the “tech talk” did not get in the way – as metalsmithing can be as “shop-oriented” as other Craft mediums. I genuinely appreciate you stopping by and for your lovely comments. Although this process does look labor-intensive, I can see how it also might be meditative. There’s always a little something about repetitive actions in making or in any craft that allows the mind to wander and sometimes inspires even future creative ideas. Thanks so much Gina Marie for stopping by, and I’m seriously enjoying your blog as well! This is an interesting insight into your final steps and into your workspace Patricia. I don’t think Ivan is sympatico with precision. It sounds as though you develop quite a flow to make it all happen. Thanks for letting us in at close range! Philippa, having been college roommates w/ a painter before, I’ve seen how metalworking is a much dirtier and “messy” profession by comparison! And our studios can often reflect this. I’ve always been floored by how the mess that we jewelers create can often result in such dramatically beautiful objects. Thanks so much for your visit and always-welcomed comments! 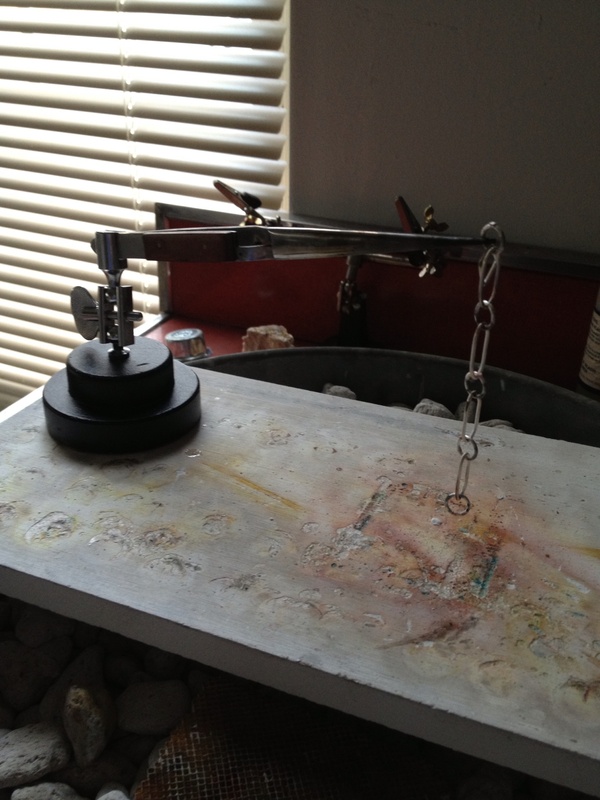 Patricia, what you say of chain making (relaxing, cathartic) is so true. And your description of the soldering process is right on! The focus it requires, the lightness of touch, the zen of it… A balancing act I can’t manage when I drink too much coffee! And speaking of zen, it’s so nice meeting Ivan. I hope we see him again soon. Dominique, I loved hearing your feedback on my post!! I feel exactly the same way about “the balance act” when soldering. In fact, I’m often teased by friends about my coffee “addiction” – so true, cannot solder half as effectively after too much coffee! And thanks for your lovely comments about Ivan; he is quite the character! Wow, that’s amazing! Where can your finished necklaces and lockets be seen? I was recently in two shows at Artspace in Raleigh, NC and another international juried exhibit in NJ. If you send me a friend’s request on FB (link is on right) you can see more of my latest metalwork in-progress. Thanks for your visit and nice to meet you! Loved this post, Patricia. What delicate, precise, work you do and I enjoyed peeking into your studio. So wonderful that you have Ivan around (great picture). I wish I could take my Domino to the studio (Tommy, my other cat would be too scared). Everyone at the art center seems to have a dog which they bring to their studios for company. I get a bit jealous! Anita, I know what you mean re: having a pet to keep us company in the studio! I have worked w/Ivan on this since we adopted him when so small; my other cat Indie would not fare well and would be getting into EVERYTHING!! 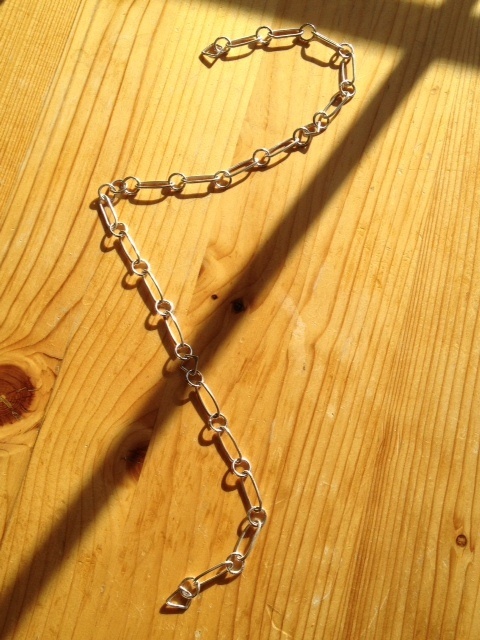 Thanks for your awesome comments re: the chain making aspect of my metals; I really enjoy doing delicate work and strive for precision in this aspect of jewelry-making. Thanks, as always, for your very much appreciated and articulate comments, Anita! I loved reading this post. I majored in metalwork at art teachers college and spent many hours making chains and other bits and pieces. Thank you for the happy memories! Jen, I had no idea you studied metals – that’s so awesome to hear! I just went back and ‘oogled’ the stunning vintage purses you recently blogged about; they look amazing! Enjoying your blog lots, and thanks so much for stopping in to leave such great comments. Chain making is a wonderful thing.